Attracted to lights in Kakamega Forest, Kenya. Oct. 2016. Length is around 40mm. 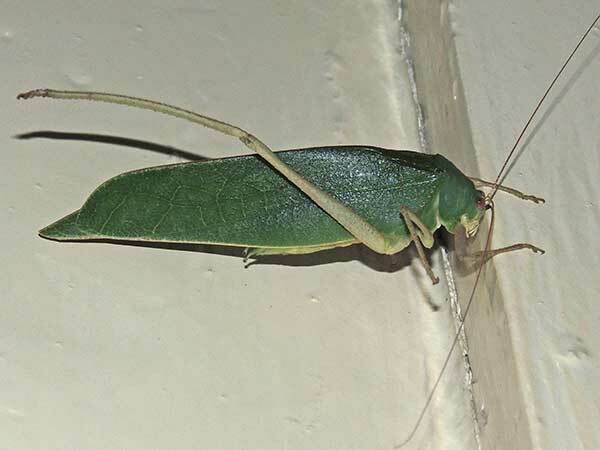 Katydids are largely nocturnal and as a result are frequently seen at electric lights. Then their leafy camouflage is ineffective making them vulnerable to predation. Primarily herbivores, they feed on a variety of plant leaves and flowers. Some species have a narrow range of preferred plant species. Copyright Michael J. Plagens, page created 13 April 2017.